"Sampath Speaking" - the thoughts of an Insurer from Thiruvallikkeni: Who is Cruel ~ who treats animals badly ? and who has the right to advise ? Who is Cruel ~ who treats animals badly ? and who has the right to advise ? Animals in India, are loved, worshipped and cared for ~ many places they share an exotic relationship with humans. In Kerala, you can see young mahout taking nap under the massive feet of elephant – that is the height of trust. There’s a scene in the movie where Baahubali’s step brother and his nemesis showcases his enormous strength by fighting a big bull. 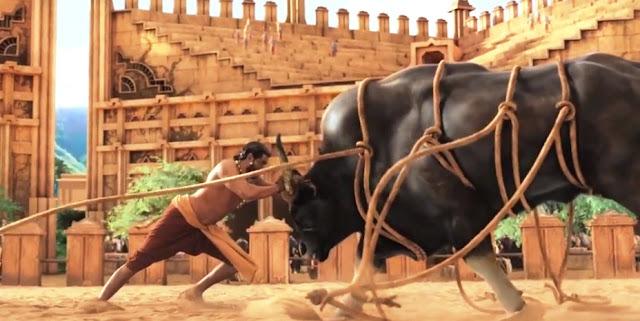 Rana Daggubati displays brute force in taming a wild bull, which a dozen men could not tether ~ below the screen would scroll, it is graphics with card mentioning that no animal was tortured. In Pammal K Sambandham too, Kamal as a stuntman would get into trouble when animal right activists would protest ! In Adimai Penn, MGR would fight a real lion – which later days he kept as pet and after death is kept in MGR museum. Much has changed since !! At a good frequency, Western World would cry coarse on animals being treated inhumanely in India. To them – in the land of snake charmers, people abuse animals. 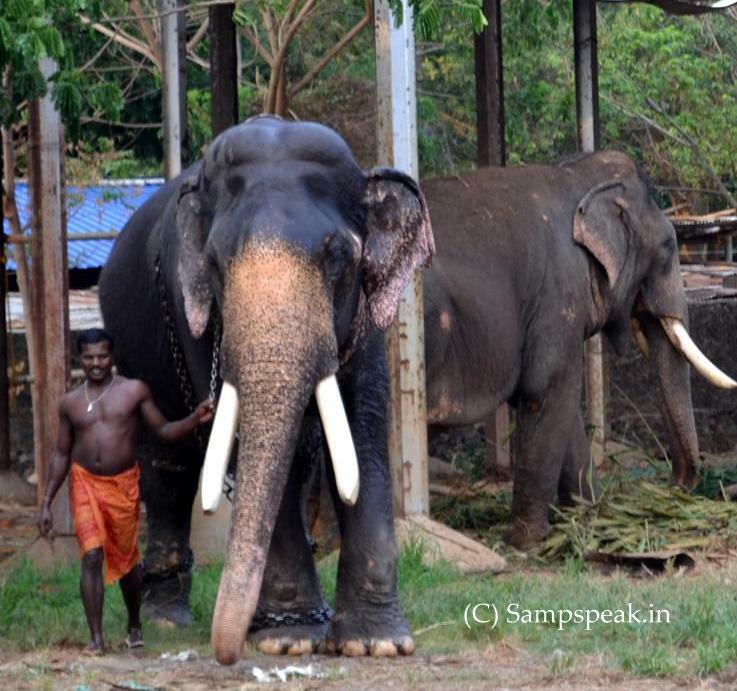 There will be documentaries and cover pages on Temple elephants in shackles and elephants being rescued from cruel mahouts and owners ! Recently there was so much of ‘chest-thumping’ on how Gajraj, who had been chained for decades in Aundh was finally freed from his sentence. The article in Western media would for its support write about the likes and shares in social media. The earlier head David Cameron promised to help an Asian elephant and one film-maker vowed to circulate to the Western World the plight of the elephants in God’s own country. They would make documentaries, show to the caring Westerners who would highlight the plight of animals stating that Indians are cruel to animals – they would raise funds and some Indians too would contribute. At the outset, all looks correct, unless you try to see some sinister design and think on who teaches what to whom ?!?!? - a couple of years back, over two million farm animals were exported live from the EU to third countries in North Africa, the Middle East and Turkey. Exports of live animals are on the increase as the farming industry is in search of new markets. Is that not the cruellest trade only next to human slaves trafficking that occurred in the previous century. The long distance live animal transport culminates with the inhumane slaughter of the animals. It is claimed that EU has put in place a number of legislative measures aiming to protect the welfare of animals. They export animals to other countries, make money and keep propaganda that conditions in third countries are vastly different from those in the EU and exported animals are no longer protected by EU transport or slaughter welfare laws once they leave its borders. In third countries, there is often no level of protection at all and slaughter practices are often in breach of the international standards of the World Organisation for Animal Health (OIE) on welfare of animals at slaughter. They would write pages that a wide range of slaughter practices which cause great animal suffering are common in regions where EU animals end up. If such animals end up slaughtered by cruel, unskilled and violent methods, causing severe pain and leaving them conscious and suffering for several minutes after any wounds are inflicted, until they eventually bleed to death, why should EU export them. They end up raking money and raking up issues that third world countries are inhumane ! Here is a report read in MailOnline about Seals being shot at Scottish fish farms that supply salmon to UK supermarkets, including M&S and Waitrose - a supermarket which has long promoted its ethical and green credentials. Here are some excerpts of the report. Licensed marksmen are hired to kill the seals by independent companies which say that the grey seal preys on their caged fish stock. The seal slaughter was revealed by new statistics published by the Scottish government. The global population of grey seals is approximately 400,000, less than African elephant and a quarter of these reside in UK waters. But they are getting killed for the supermarkets want salmons ! Waitrose said that it is working with companies to limit seal deaths and it requires all its farmed salmon suppliers to take rigorous non-lethal measures to deter predators, including seals. These include the proper use of acoustic devices, tensioned and weighted nets and the efficient removal of dead fish, which can attract seals. Marine Harvest admitted it killed 21 seals last year. The company supplies fish to Waitrose and Sainsbury's. Steve Bracken, Business Support Manager of Marine Harvest Scotland told MailOnline that the company was disappointed by and regretted any increase in seal deaths. He said that seal deaths through culls have decreased substantially in recent years. But Andy Ottaway, Campaign Director with the Seal Protection Action Group (SPAG) said that approximately 1,600 seals were reported shot in the past six years alone in Scotland and that this is still too many. 'The companies shooting the most seals are Marine Harvest who supply Sainsbury's and Waitrose, and Scottish Sea Farms who supply Marks and Spencer's. 'They reported shooting 40 seals between them in 2016 out of a total of 75 shot by aquaculture, with 99 seals shot by all sectors in total,' he said. 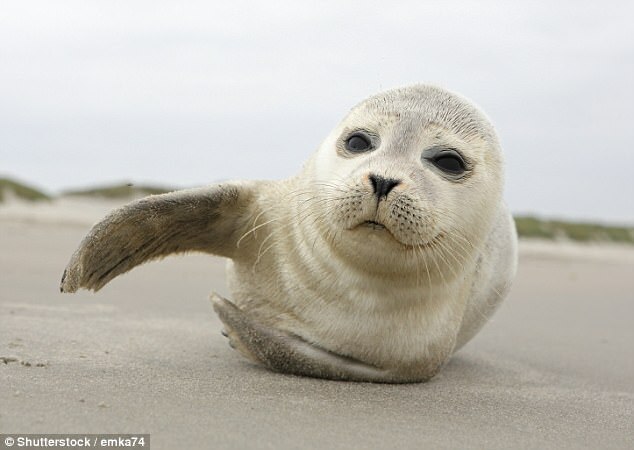 He told the MailOnline that the grey seal is a lot less common than many people believe. 'The SPAG wants to see an end to seal killing and for the Scottish Salmon Industry to adopt strictly non-lethal methods to deter seals. Leading supermarkets can help by insisting their salmon suppliers stop killing seals.' 'Fishing is a multimillion pound industry in Scotland and if shooting seals was illegal, the industry would have to invest in preventing seals from accessing stocks rather than just shooting them.' Although Scotland permits seals to be shot, a Seal Licence introduced in 2011 stipulates that they can only be shot with a permit. Fish-farmers account for around half the total of seals shot and number of shootings has gone down by 70% from 240 in 2011 to around 75 in 2016. 'Seals are under a lot of pressure - from over fishing, culls, disease - and protecting them is an ethical issue. If killing is inhumane, it would provide no excuse, if some were to say that they have stringent laws in place. Next time, you hear a campaign on ‘Save elephant or some other animal in Asia’ – tell them to keep their house in order first. Savagery has no moral right to advocate on cruelty.